As always, Week 16 presents some interesting matchups in the NFL, particularly when it comes to coaches going up against each other. Each week, Head Coach Ranking presents its exclusive Head 2 Head numbers – comparing the rankings of the coaches that are facing off. • There are two games this week that feature both coaches in the Head Coach Ranking top 10. The first takes place Saturday, when the Baltimore Ravens travel west to face the Los Angeles Chargers. Baltimore’s John Harbaugh is tied for fourth with an HCR grade of 7.7. The Chargers’ Anthony Lynn is tied for seventh at 7.4. One interesting note: Should the Ravens get a victory here, there is an excellent chance these coaches will meet again in the first round of the playoffs in two weeks. The second game is Kansas City-Seattle. The Chiefs’ Andy Reid is second overall with an HCR grade of 7.9. 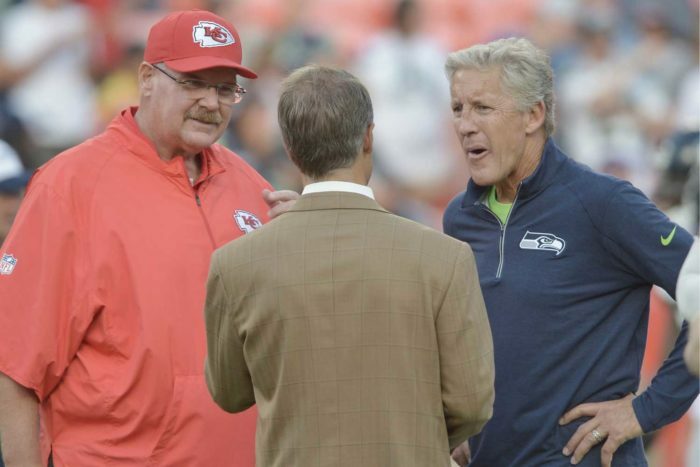 The Seahawks’ Pete Carroll is tied for ninth at 7.3. The Patriots’ Bill Belichick is tied for fifth with an HCR grade of 7.7. Mike Tomlin of the Steelers is tied for 10th at 7.2. • For the second week in a row, Pat Shurmur of the Giants faces another first-year head coach. Last week, Shurmur and the Giants lost to Mike Vrabel and the Titans. This week he faces Frank Reich and the Indianapolis Colts. While Shurmur has been near the bottom of the Head Coach Rankings most of the season (he’s currently tied for 28th at 6.5), Reich has been steadily climbing the list. His overall score of 7.3 is tied for ninth. • There are six division games this week: Vikings-Lions, Falcons-Panthers, Bengals-Browns, Bills-Saints, Rams-Cardinals, and Broncos-Raiders. Oddly, none of them have playoff implications for both teams. • Five games – four of which are inter-conference affairs – have playoff implications for both teams involved: Ravens-Chargers, Redskins-Titans, Texans-Eagles, Steelers-Saints, and Chiefs-Seahawks.